An exceptional, fine and impressive vintage Elizabeth II English sterling silver flatware service for six persons by Garrard & Co Ltd - boxed; an addition to our canteen of cutlery collection. The pieces of this impressive, vintage sterling silver canteen of cutlery for six persons have been crafted in the Hanoverian Rat Tail pattern. Each spoon and fork features a pip to the handle terminal, and the spoons feature a rat tail to the reverse of the bowls. This Sheffield canteen of cutlery consists of 63 pieces: Basic service: Six table knives Six table forks Six soup spoons Six dessert knives Six dessert forks Six dessert spoons Six teaspoons Six coffee spoons Six egg spoons Additional pieces: Four serving spoons Sauce ladle Sugar tongs Large carving knife Small carving knife Sharpening steel The components of this canteen, including the original knives were crafted by the renowned silversmiths Garrard & Co Ltd in 1970; the components will have been crafted in the same year but due to the hallmarking system the items are struck with the date letters B and C. The original knives bear the maker's mark 'Garrard & Co Ltd, 112 Regent Street, Made in England, Rustless' to the stainless steel blades. This exceptional canteen of cutlery is fitted to the original and impressive mahogany wood lift up lid canteen box with green velvet interior. The canteen box secures with a functional locking mechanism and key. Condition: This vintage silver canteen of cutlery is an exceptional gauge of silver, exceptional quality and in exceptional condition. The service has been professionally polished and is in presentation condition. The mahogany wood box is in presentation condition. Full hallmarks struck to the reverse surface of each piece are all very clear; the hallmarks are struck deeply due to the exceptional gauge of silver. Reflections in photographs may detract from the true representation of this fine and impressive canteen. 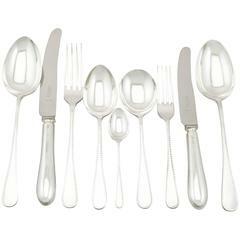 Dimensions: Table knife 24.2cm/9.5" Table fork 19.9cm/7.8" Soup spoon 17.2cm/6.8" Dessert knife 21.5cm/8.5" Dessert fork 16.9cm/6.7" Dessert spoon 17.7cm/7" Teaspoon 11.9cm/4.7" Coffee Spoon 11.2cm/4.4" Egg spoon 11.9cm/4.7" Serving Spoon 20cm/7.9" Sauce ladle 15.8cm/6.2" Sugar tongs 10.5cm/4.1" Carving knife 36.1cm/14.2" Carving fork 27.4cm/10.8" Sharpening steel 32cm/12.6" Total weight 58.5 troy ounces/1818g (excluding knives and carving set) Reflections in photographs may detract from the true representation of this fine and impressive canteen. Sterling Silver fish cutlery set (knife and fork) with "Jungenstil" (Art Nouveau) ornaments.